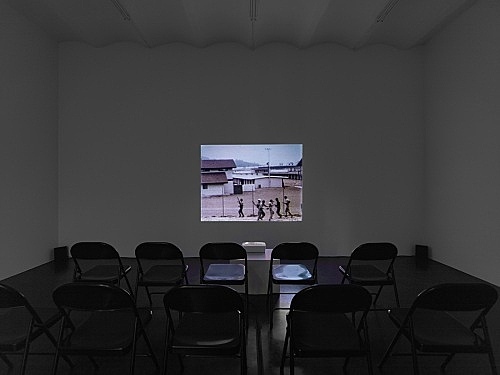 Tony Conrad, der Beholden to Victory 1980 ursprünglich auf Super-8-Tonfilm drehte, bediente sich für seinen Film der Genremittel des Kriegsfilms und besetzte ihn mit Freunden und Kollegen wie Mike Kelley, David Antin, Sheldon Nodelman und Tony Oursler. Er führte nicht auf klassische Art Regie, sondern ließ seine Darsteller auf Grundlage nicht schriftlich fixierter Szenarien im Rahmen streng definierter Rollen wie “Offizier” oder “Soldat” improvisieren. Jede einzelne dieser Rollen umfasste klar definierte Regeln und Beschränkungen. Beholden to Victory spiegelt die auf der Leinwand dargestellten militaristischen Themen und Machtverhältnisse zwischen Soldaten und Offizieren wieder und weitet sie auf die zwischen den Schauspielern und der Kamera, der Kamera und dem Regisseur sowie dem Zuschauer und dem Film konstruierten Hierarchien aus. 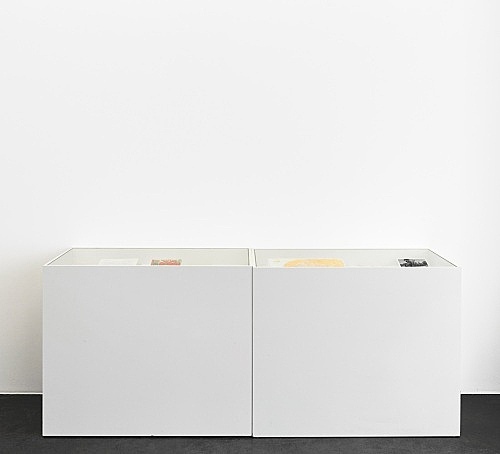 Die hier gezeigte Version des Films folgt einer Konfiguration des Filmmaterials, das Tony Conrad 2007 entwickelt hat. Das Filmmaterial wird digital mit einem Computerprogramm projiziert, dass dem Zufallsprinzip folgend die einzelnen Sequenzen des Filmes bei jeder Vorführung unterschiedlich zusammensetzt. Beholden to Victory is an edited video version of the full-length Super-8 ‘war movie’ genre picture Hail the Fallen (…) The film was not directed in the traditional sense, as there was no script, and the actors were required to play as in a game – to follow certain rules, or, more precisely, to observe certain restrictions. They were told only what they were not allowed to do. Because of this strategy there are few edits in the film, and the only parts edited out are examples of the actors doing what they were not supposed to do. The film thus consists of a series of scenes that are examples of correct behavior. I met Tony Conrad when I did a presentation in his class while he was a visiting professor of media in the visual arts department at the University of California, San Diego. I was a great admirer of his position in the 1960s New York art music scene and also of his early structural and demonstrational films (such as the famous ‘flicker’ film and his “cooked” films). So I was surprised to see him tackle the genre film, an act that he told me was not looked upon kindly by his peers. At this time I was sharing an apartment in Hollywood with the video artist Tony Oursler and we were, among other things, making noise music. Tony Conrad would sometimes stay with us when he came up to Los Angeles, so it was only natural that Tony and I would end up in this film. We were outfitted in military gear and taken to the desert for a mission. Then we were informed of what we were not allowed to do and were left to struggle with what we could do. edited by John C. Welchman, MIT Press, Cambridge, Mass., 2004, p. 180-181. 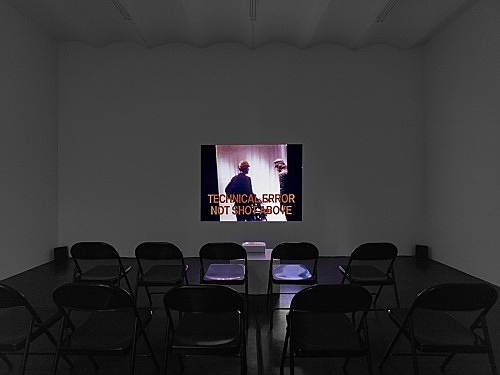 Tony Conrad filmed Beholden to Victory in 1980 on sound Super-8 film. 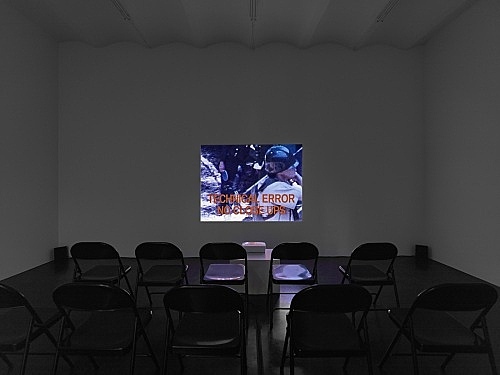 Using the devices of the war film genre, Tony Conrad cast his film with friends and colleagues, such as Mike Kelley, David Antin, Sheldon Nodelman, and Tony Oursler. Rather than directing the actors, he presented them with unscripted scenarios that could only be enacted within the strictly defined roles of ‘officer’ or ‘soldier’. 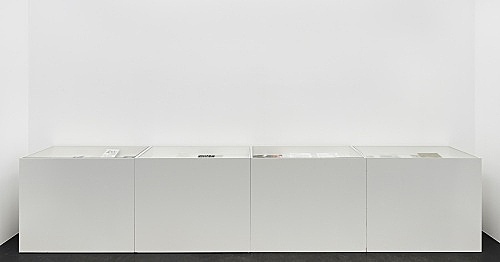 Each title carried its own set of rules and restrictions. Beholden to Victory extends and echoes the militaristic themes and power relationships depicted on screen between the soldiers and officers within the film to the hierarchies constructed between the actors and the camera, the camera and the director, and the audience and the film. 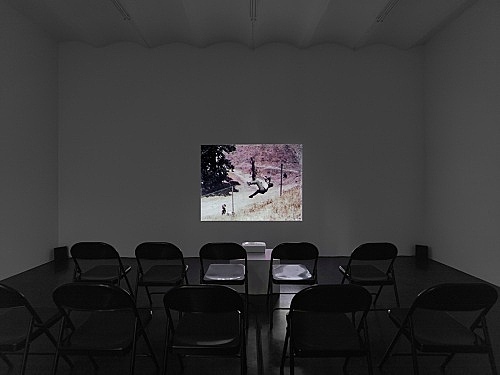 We present the film as a configuration of the material that Tony Conrad developed in 2007. 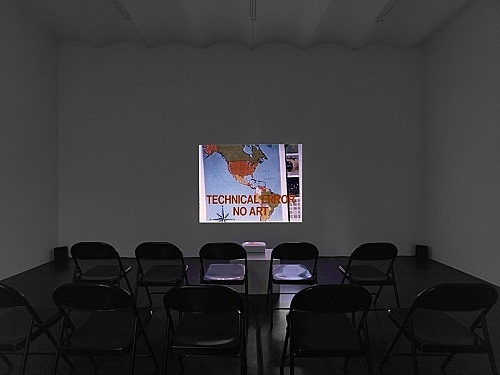 The film material is being digitally projected as a random-edited computer video, which runs differently in every presentation. Beholden to Victory is an edited video version of the full-length Super-8 ‘war movie’ genre picture Hail the Fallen. (…) The film was not directed in the traditional sense, as there was no script, and the actors were required to play as in a game – to follow certain rules, or, more precisely, to observe certain restrictions. They were told only what they were not allowed to do. Because of this strategy there are few edits in the film, and the only parts edited out are examples of the actors doing what they were not supposed to do. The film thus consists of a series of scenes that are examples of correct behavior.